FIRENZE. OK, after the most nightmare like trip (litterally thought the plane was going to crash due to the insane storm in Zürich where I had my connecting flight), I FINALLY made it to Florence for the Luisa Via Roma event Firenze 4-ever!! So happy to be back again and of course reuniting with all my blogger friends. My boyfriend is flying in today so hopefully I’ll be able to post some outfit pictures tomorrow! This entry was posted in Shopping and tagged Celine, fashion blog, firenze 4-ever, luisa via roma by Carolina Engman. Bookmark the permalink. Enjoy it!!! !I think it’s a purse :)!!! Oh wow! you’ve got sth from Céline! well it looks like stockings but,the actual thing céline is known for ,are their bags! if you want you can check out my <a href= "http://got-no-limit.blogspot.com/2011/12/london-guide.html&quot; LONDON SHPPING-GUIDE! i think you’d love it! So curious what’s inside this little bag. Have fun in Florence! Have been in Zürich yesterday myself (luckily not on a plane) – insane winds!! Thought it was going to blow the roof of the house off :-P Glad you made it to Firenze safely! I’m very glad you’re in my city!!! hmm, maybe a little handbag? or a jewellery? or a wallet? I don’t know what’s in that Céline bag but I’m sure it’s BEAUTIFUL!! Can’t wait to see it. Have fun @ the event! Have a great Time there!!! Enjoy the event!!! Lucky you whatever you got from Celine! I’m thinking what is in box?? :D can’t wait for new post with outfit!! Can’t wait to see some outfitphotos! Oh no a storm while you were flying, thats very scary. I’d guess sunglasses or a small bag? a mini bag or some lovely celine shoes? I’m guessing, it’s a purse, or Trio bag. Perhaps in bordeaux. Love the fact you are here in Italy! Oh I love firenze!! Have fun over there! May I invite you to my giveaway? I’m soooo afraid of flying, I would have had a shock during your flight.. Oooh!!! I have no idea what is in the bag- shirt? Wallet? I even just like the bag from the store, pretty. Can’t wait to read about the event soon! Definitely think it could be a clutch of some sort! Celine has gorgeous leather goods! I’m curious! I wanna see what’s inside! Celine…good choice! Welcome in Italy! Sorry to hear about your travel woes. My guess that its a beautiful blouse in the bag – in any case I’m sure it was a great buy! What ever it is I’m sure its great, lucky you!! Ah I’m so curious.. Hmmm, a black blouse? Enjoy your time! Can’t wait to see what you found… – really great idea… and great teaser! I am going to say a Celine Nano or Celine mint green jumper. Glad to hear you’re safe. I can’t wait to see what’s in the bag! Can’t wait to see what’s in the bag!! Looove Céline too. <3 wish this was sitting in my room! ahhh celine..
Can we see your bag??? So curious…I’ll wait for the pictures of your outfits! Couldn’t guess, but I’m hopping that tomorrow you’ll reveal it tomorrow! mmm… i think is a t-shirt? :P or a sweater! A CLUTCH MAYBE? OR SHOES?? I won’t guess I want to be surprised – I wish I could be in Firenze right now! Extremely hard guessing what’s inside the bag because Céline has so many beautiful things..
I’m so curious to know what is inside that bag ! Can’t wait to see your latest outfits ! I think it’s a purse! 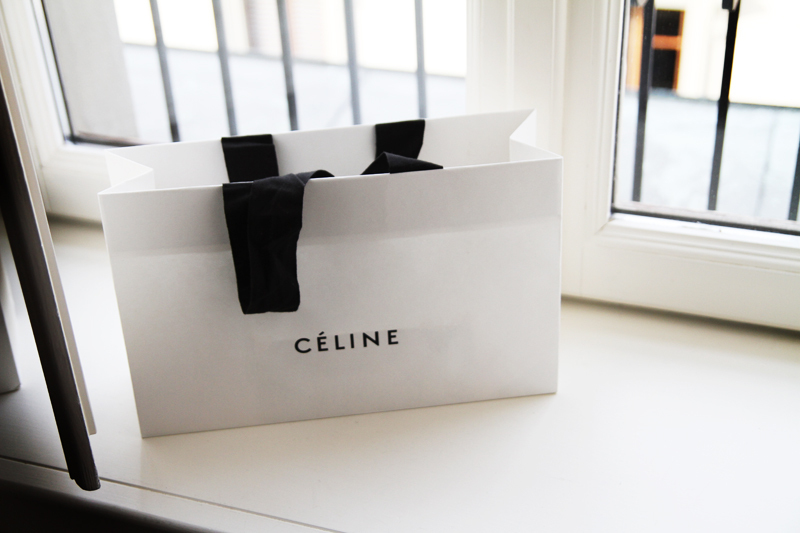 I want a CELINE bag….. I am quit excited now, Carolina! OMG! It must have been a terrible experience!! Lucky everything ended ok!! Maybe a clutch or another bag?? I guess it wright ! Audrey sunglasses ! That must have been a scary flight!